Used frequently for anxiety and/or depression, and for the mental stress associated with overwork. May be accompanied by the following: Headache, vertigo, insomnia, deficiency of vital energy and blood, palpitations, poor memory, uneasiness, dizziness, ringing in the ears, forgetfulness. 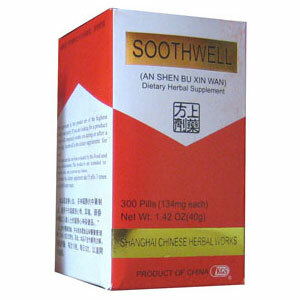 An Shen Bu Xin Wan is an excellent dietary supplement which gives the body a total feeling of tranquility. This tonic pill was developed from the ancient art of Chinese healing as a remedy for discomforting feelings of uneasiness. The ingredients in this product are of the highest quality and purity. If you are looking for a product which will completely soothe you during an active and busy day, this is the ideal dietary supplement for you. Tranquilize the spirit, supplement the heart, nourish Kidney Yin and Liver Yin, Supplement Blood. Strengthens Kidneys and Heart.